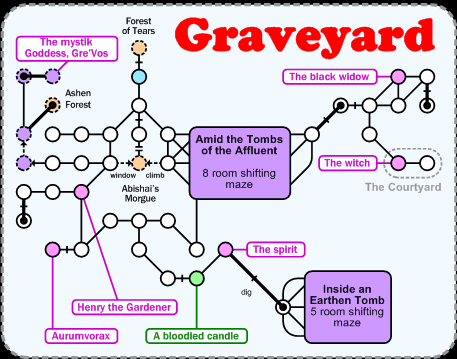 The Graveyard, a fun area filled with quests for some very spiffy little items. Most of the mobs in the area are cultists (during the day) or monsters like mummies, skeletons and the like (during the night). The switch occurs at dusk and dawn. You may wish to check out the information on bands of power / blessing of demons. Walk ( 9w, sw, 4w, s, sw, 2w, open s, s ) to get from DH to the room marked in blue.